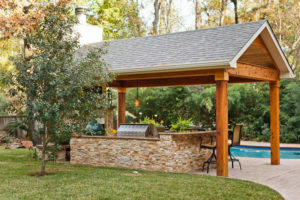 This back yard retreat is perfect for family and friends to enjoy an old fashioned Texas BBQ. 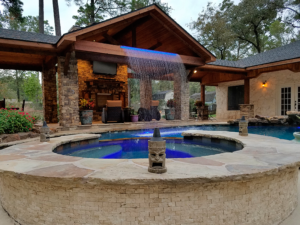 The patio is spacious and features Belgard Catalina slate stone pavers using 6 different shapes and sizes installed in multiple designs to create different effects throughout the large patio. 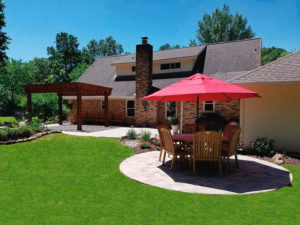 A circle shaped patio extension provided a nice touch to the overall appearance of this project. Two structures provide cover from direct sunlight; the first is a cedar composite shingle hip roof structure with stained cedar tongue and groove ceiling and recessed lighting. A special order over-sized Energy Star Haiku fan was installed to keep everyone cool in the summer months. The second structure is a natural, rough cut red cedar wood pergola that is protected with wood stain & sealer by Ready Seal. 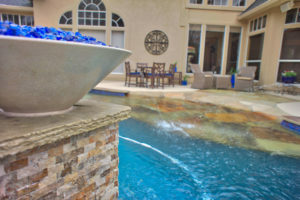 Surrounding the pavers is a natural pond with a waterfall and colorful drought tolerant landscaping. At night, Kichler LED landscape lighting accentuates the yards beauty and provides safety and value to the property.